As a followup to Snuffles The First, I have actually decided to down-engineer something (can you believe it?) while adding tweaks and more advanced technologies. This rebuild is intended as a testing bed for small-EV technologies as well as my way of getting around town faster. The design has exactly two moving parts – the front wheel and the rear wheel. 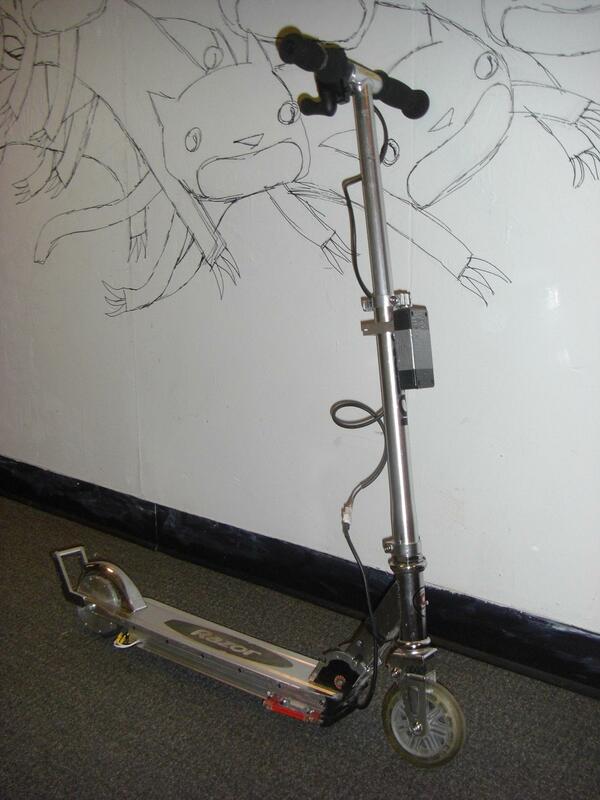 Propulsion is provided by a custom-built in-wheel electric motor (a hub motor) that is mounted inside the rear wheel. No mechanical parts protrude or rotate externally, and the standard fender friction brake still works. Batteries are housed in an aluminum frame extension under the scooter body. The entire scooter weighs under 14 pounds and can propel a 150 pound person at speeds up to 12 miles per hour on level ground. The epic saga of the RazEr, including a full engineering history, can be found in its build report category. If you are interested in building your own hub motors, I have prepared an Instructables page detailing some of the underlying principles behind RazEr’s motor.